Miall, Andrew D. . "Geological Regions". The Canadian Encyclopedia, 06 July 2015, Historica Canada. 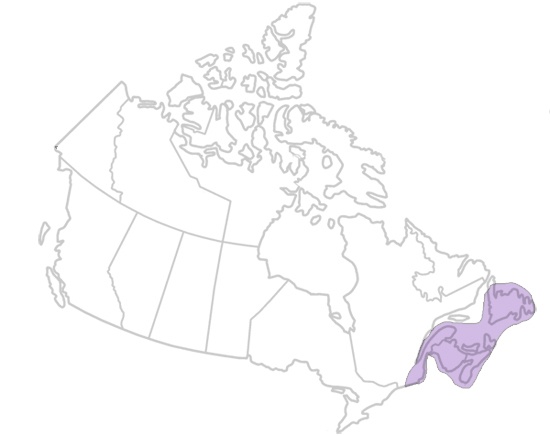 https://www.thecanadianencyclopedia.ca/en/article/geological-regions. Accessed 25 April 2019. 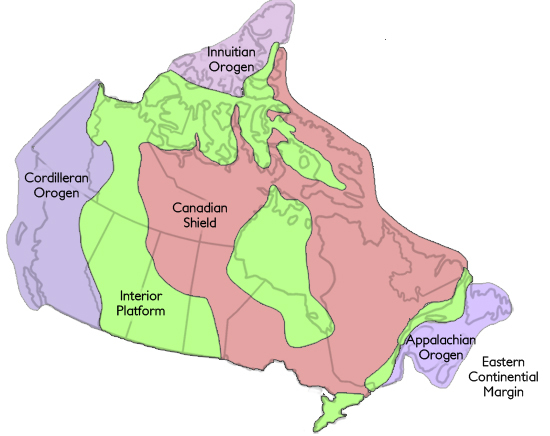 Based on geological history, Canada can be divided into six regions, each characterized by a distinctive landscape: the Canadian Shield, Interior Platform, Appalachian Orogen, Innuitian Orogen, Cordillera and Western Canada Sedimentary Basin, and the Eastern Continental Margin. 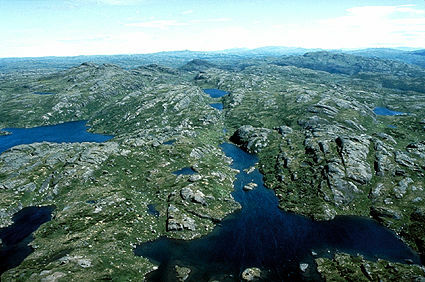 The northern Yukon underwent folding, granitic intrusion and uplift to create the Arctic Cordillera (photo by Barbara Brundege and Eugene Fisher). 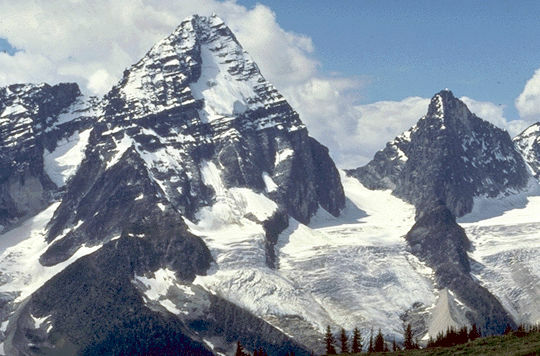 Glaciers cover 10% of the world's land surface. 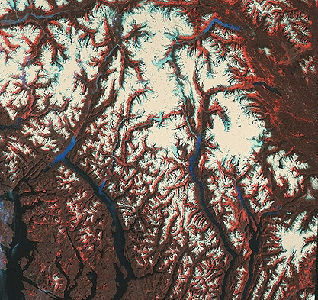 This satellite image shows glaciers and icefields in northwest BC. The long, narrow fjords were carved by the ice sheets on their last retreat (courtesy Canada Centre for Remote Sensing). This remote sensing image shows the rugged surface of the Shield with myriad scratches and channels gouged by the ice sheets. Sudbury, Ontario, appears as a purplish patch in the lower right (courtesy Canada Centre for Remote Sensing). 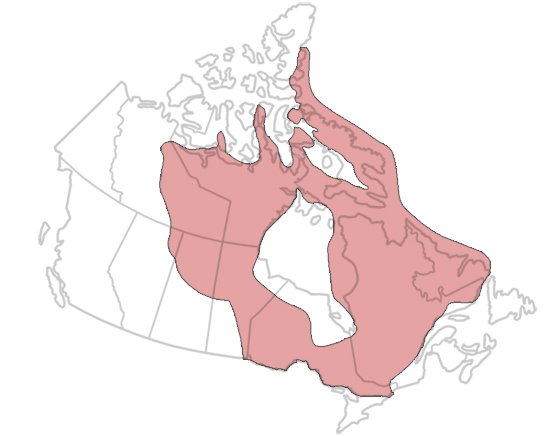 The North American continent, of which Canada represents the northern half, was assembled from continental fragments by the process of plate tectonics. Scientists think that this process started more than 3 billion years ago, when the production of continental crust first began. During the Hadean period, early Earth consisted of an undifferentiated mass of largely molten matter, created by the buildup of materials in the form of planetismals and meteorites circling around the sun in the primitive solar system. Under the force of gravity, the lighter elements gradually migrated towards the Earth’s surface, and it was this process that began the differentiation of the Earth’s surface into continental and oceanic crust. The lightest materials constitute the continental crust. They remain at the surface and preserve some record of the long history of Earth’s construction. The materials that constitute the crust that now lies beneath the oceans are somewhat more dense. The continual release of radiogenic heat from the Earth’s interior takes place along the seafloor in the middle of oceans, and it is this process that causes continental tectonic plates to move across the Earth’ surface, at rates of approximately 3 to 15 cm per year. 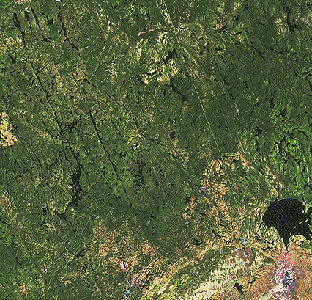 The Canadian Shield, which occupies the centre of the country, is so named because its outline suggests the shape of the shields carried by soldiers in the days of hand-to-hand combat. However, this just refers to its outcrop area. 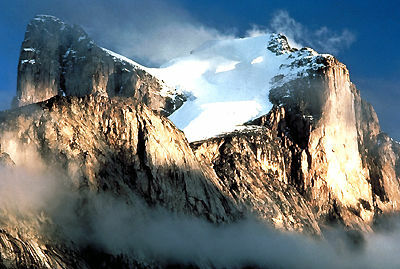 Rocks of the Shield underlie the interior of the continent beneath the Rocky Mountains, as well as the interior plains of Canada and the United States, where the sedimentary rocks of the Interior Platform cover them. The Shield is composed of ancient rocks, including some that are among the oldest rocks on Earth (possibly more than 4 billion years old). The construction of the Shield involved the collision and build-up of a large number of tectonic plates beginning more than 3 billion years ago and was largely completed by about 800 million years ago. The core of most of the world’s major continents was created by the same plate-tectonic process. One of the last major plate collisions involved in the assembly of the Canadian Shield is named the Grenville Orogeny. This involved a large-scale amalgamation of most of the Earth’s continental plates about a billion years ago into a “supercontinent” that geologists call Rodinia. The collision built a gigantic mountain belt that ran northeast–southwest across eastern North America, with mountains probably rivalling the Himalayas in scale stretching across Québec, Ontario south of Sudbury and down the eastern half of the continent to Texas. Erosion removed some 20 km of the crust over the next few 100 million years, so that when a great invasion of the sea began about 600 million years ago the landscape was almost flat. This region is named for the area of the Shield covered by rocks from the Cambrian to Cenozoic eras. They are largely flat-lying, and this is the main reason for the gentle, low-lying topography that characterizes the landscape. 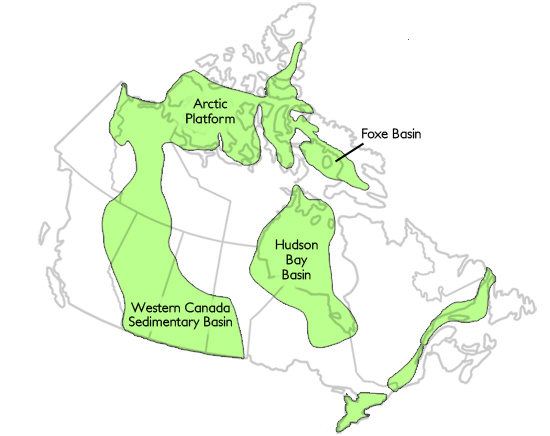 In Canada the Interior Platform includes the prairies of Manitoba, Saskatchewan and Alberta, where the rocks constitute the lower half of the Western Canada Sedimentary Basin. It extends northward down the Mackenzie Valley and then eastward across the Arctic Platform, the belt of Arctic Islands lying south of the Northwest Passage. 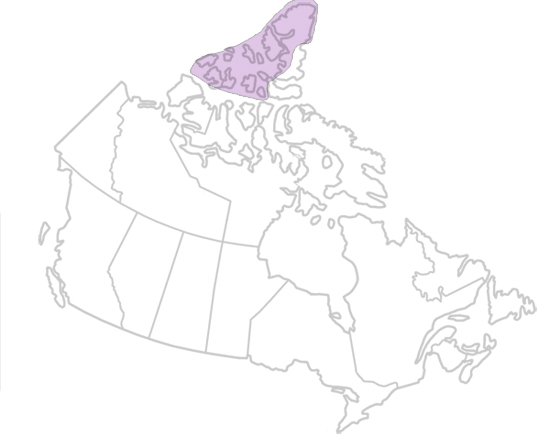 An area underlain by largely flat-lying Paleozoic sedimentary rocks also extends from southwestern Ontario, down the St. Lawrence Valley and across the Gulf of St. Lawrence, through Anticosti Island to westernmost Newfoundland. Within the Canadian Shield thin remnants of the same sedimentary cover occupy the Hudson Bay and Foxe Basins. All of these areas underwent a major invasion of the sea at some time between about 550 and 450 million years ago, which lasted until late in the Devonian period, about 360 million years ago. As a result a gigantic inland sea developed, probably covering almost the entire continent. In it, some of the earliest invertebrate life forms flourished, including trilobites, brachiopods and corals. The limestones that were deposited at this time are well seen in the front ranges of the Rocky Mountains, in the Niagara Gorge and underlying Parliament Hill in Ottawa. Reefs formed by primitive colonial organisms flourished in the area corresponding to present-day Alberta, and became the host for much of the oil and gas that forms the foundation for the modern economy of that province. At the time the marine invasion of Canada was taking place, the giant continent, Rodinia, was beginning to break up, forming new oceans. Evidence of this can be seen along the continental margins of interior British Columbia and in Newfoundland, where the edge of the Canadian Shield is thin and faulted, and covered with shallow-marine sedimentary rocks. Off what is now eastern North America an ocean developed that probably rivalled the modern Atlantic Ocean in size, but it did not last long. By the end of Cambrian time (about 500 million years ago) a process called subduction began. This is the same process that is occurring around the edge of most of the modern Pacific Ocean (and is responsible for most of the world’s most violent earthquakes). During subduction, oceanic crust bends down and is swallowed up beneath the continental margin, and the tectonic processes that result include the building of mountain belts and chains of volcanoes, resulting in much disruption of the local geology. The oceanic crust that undergoes subduction is reabsorbed into the mantle. Geological evidence indicates that the island of Newfoundland contains remnants of the destruction by subduction of an entire ocean. The Avalon Peninsula, in the east, represents a sliver of a continent that formerly lay somewhere between Britain and Africa. In Gros Morne National Park it is possible to see where a fragment of the Earth’s oceanic crust and mantle was pushed up over the ancient continental margin during the subduction process. The belt of deformed rocks that developed during this oceanic closure extends southwestwards through the Atlantic provinces and down the eastern margin of the United States, and is collectively referred to as the Appalachian Orogen. Its formation took a long time, and was only completed about 250 million years ago, when the tectonic plates corresponding to modern Europe and Africa finally collided with and welded against the eastern North American margin. By this time, much of what is now eastern Canada (and what were then the adjacent areas of Britain and northwest Europe) was covered by the world’s first large trees in widespread forests that, when buried, turned into coal. These collisions were the culminating events in the generation of a new supercontinent, Pangea. North of the Arctic Platform, in the area that corresponds to the Queen Elizabeth Islands, lie two overlapping sedimentary basins (Franklin Basin and Sverdrup basin) making up the Innuitian Orogen. The two basins have been accumulating sedimentary deposits since the Cambrian period, 500 million years ago. Until about 100 million years ago, two small continental plates corresponding to parts of modern Alaska and Siberia lay just to the north, and shed sediment into these Arctic basins. In the late Paleozoic era, reverberations from the plate collisions that generated Pangea were transmitted across Greenland, and led to folding and faulting in Ellesmere and Axel Heiberg Islands. 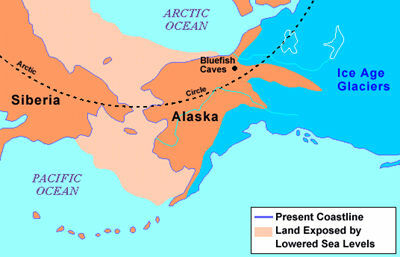 In the Cretaceous period, some 100 million years ago, sea-floor spreading created the Arctic Ocean as Alaska and Siberia rotated counter-clockwise into their present positions. Shortly afterwards, part of the process of Pangea’s breakup led to the separation of Greenland from Canada, opening the narrow seaway between Greenland and Baffin Island. The modern continental configurations began to take shape about 200 million years ago, with the breakup of Pangea. The Atlantic Ocean began to open in the east, and the North American continent began a long, slow drift in a northwesterly direction. This took Canada from equatorial to more northern latitudes for the first time, and the westward drift across the ancient Pacific Ocean caused several large landmasses that were located out on the Pacific oceanic crust to collide and become amalgamated with the western edge of the continent. 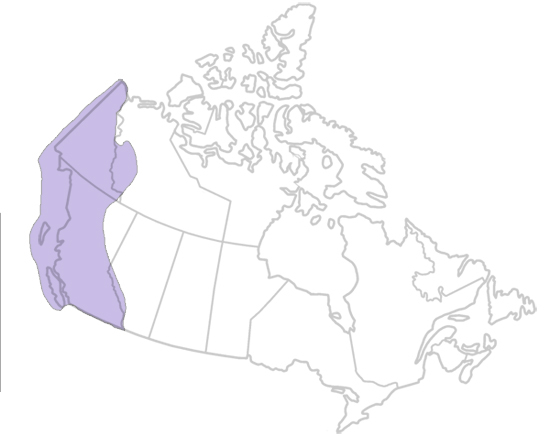 Most of British Columbia was formed in this way and the succession of collisions, volcanic episodes, and periods of metamorphism and folding are what largely account for the rugged nature of the Cordilleran belt that extends from Alaska down through the western United States. One important effect of the collisions was to push giant slabs of rock lying at the edge of the Interior Platform of Alberta and the Northwest Territories upwards and eastwards along thrust faults to form the front ranges of the present Rocky Mountains. Gravel, sand, silt and mud shed eastward from the uplift and erosion of these rising mountains, beginning about 160 million years ago, form thick deposits of sandstone, siltstone and shale that lie on the Paleozoic limestones of the Interior Platform from the Yukon North Slope through Alberta and as far south as Texas. The youngest rocks that form the topmost sedimentary layer immediately to the east of the Rockies, such as the Paskapoo Sandstone of Calgary, originated as debris carried eastward by the ancestors of the present-day Bow and Athabasca rivers. Subduction of the Pacific Ocean plate continues offshore west of Vancouver Island. Volcanoes such as Mount St. Helens (in Washington State) are created by this process. Volcanic eruptions occurred near the Whistler Ski Centre only a few 1,000 years ago and could occur again, though geologists think that a major earthquake somewhere along the west coast is a more immediate danger. The present-day east coast represents a ragged tear across the Appalachian Orogen. Part of this belt of rocks was left behind on the North American side by the opening of the Atlantic Ocean, and part was carried eastward and now underlies Britain and Scandinavia. As the continental margins were stretched and broken to form the margins of North America and Europe, beginning about 200 million years ago, they subsided and became sites for the accumulation of thick sedimentary deposits derived from the adjacent continents. In places, most notably beneath the Grand Banks off Newfoundland, this process was followed by the generation, migration and trapping of large volumes of oil which now form the Hibernia and other oil fields of that region. N. Eyles and A. D. Miall, Canada Rocks (2007). R.J.W. Douglas, ed, Geology and Economic Minerals of Canada (2 vols, 1970).